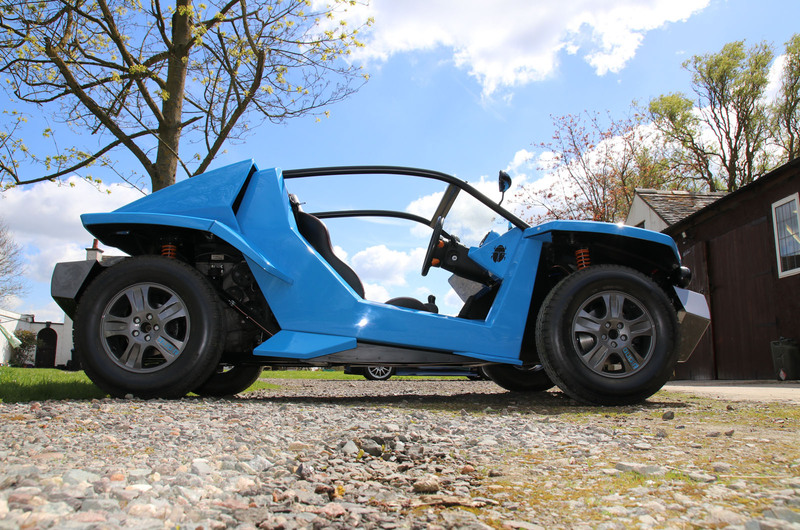 Lee Noble, the founder of Noble Automotive, has launched the Bug:R; an £18,000 beach buggy which uses Mk3 Ford Mondeo parts, and is available for either kit car build or fully-made. The £18k roofless buggy uses Mk3 Ford Mondeo parts and has the potential to be fitted with almost any engine. Around 20-30 are expected to be sold each year, but Noble is but is open to the idea of licensing the design abroad to eke out a few more for use at holiday hotspots around the world. Most are expected to be sold as ready-built cars for £18,000, rather than the £10,000 self-assembly kit, given the dwindling state of the kit car market. “It was purely based on frustration with Exile, in the middle of summer 2016. I thought it would be nice to have a toy to play with,” said Noble, explaining the rationale behind the unusual model. Noble’s Bug:R is based on the platform of a Mk3 Ford Mondeo; parts are cheap, reliable and plentiful, said Noble, and almost any engine could be installed in the car’s mid-engined, rear-wheel drive setup. A four-cylinder petrol will be the most common engine fitted in the car, said Noble. He’d like to see a V6 used, but demand would be low. Four-wheel drive is not an option: “if someone asked for four-wheel drive I’d tell them to buy a Landie,” said Noble. The Bug:R is made with fun in mind, and depending on the owner’s lifestyle, could be made in as little as two weeks. Really? Great name. As in I can't get the bug@er started because I made it in a shed? Pretty cool though. More please. That seems to be a glaringly obvious design flaw, unless it's intended to be used solely off road. In which case, there's no market. It's got the same rear visibility as the millions of vans on the road today; there's no problem with using them on the road. I'm looking for a little project at the moment, this seems right up my street! So this is what we have to look forward in the years ahead. Kit cars rolling off the production line at a rate of 30 per year based on an old Mondeo. Also for £18,000 you can buy a Bug:R to have some fun, although I suspect fun, as a concept, is not something you understand. I could probably come up with a list of 100 used cars at that price that would be more fun than this, including original beach buggies, if that's your thing.